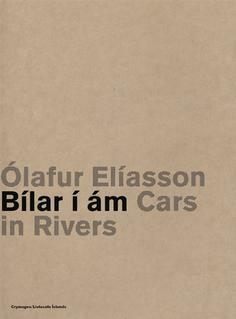 Cars in Rivers by Olafur Eliasson photograpic book. World famous artist. Icelandic design in online store. adventurers, Ólafur Elíasson pays homage to a cultural activity born out of a direct struggle with nature, since motorized exploration of the Icelandic highlands is only a recent experience. The book is also an homage to the “unknown explorer” and his extensive terrain, sublime nature. At the same time the series can, in a symbolic way, describe the economic crisis the Icelandic nation has been enduring. The metaphor of a half sunk jeep stranded in the middle of a raging river is unmistakable.